"Anansi the spider, a lazy, clever trickster, has figured out how Hyena does his housekeeping--with a magic stick that does all the work for him. 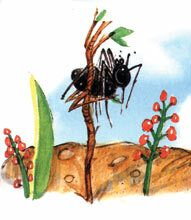 Of course, Anansi must have that stick, and this story is about the out-of-control magic that results when he gets it. Children will delight in Jerry Terheyden's reading of this tale; the many creatures, from the snuffly warthog to the gruff lion, all get their own distinct voices, and there are plenty of fun sound effects to round out the production. Terheyden's Anansi is especially funny, and kids will enjoy listening to how the spider gets himself in and out of trouble." "That mischievous spider Anansi is up to his old tricks in this story by Eric A Kimmel. When the lazy Anansi discovers that Hyena's trick to keeping his home so spotless without any work is a magic stick, Anansi steals the stick with disastrous results. He begins by having the magic stick clean his yard while ignoring the fact that all of his trash is being blown into Lion's yard. Then, while having the magic stick paint his house, the stick paints Zebra pink, and dumps all of the weeds form Anansi's yard into Warthog's tomato patch. Finally, when a flood ensues as a result of Anansi's command for the stick to water his garden while he napped, Hyena takes the magic stick back, ending Anansi's bout of trickery. Narrator Jerry Terheyden accurately captures the essence of each of the animals in Janet Steven's illustrations. Whether it is with braying voice of Zebra, the snorting of Warthog, the pride of Lion, the slyness of Hyena, or the tiny timid voice of Ananasi, Terheyden's narration makes the characters come alive. A truly delightful addition to any collection."